Just when you think thing are crazy, things get a little crazier. Friday night I was snuggling up with Liana while she slept. Around 12 am the nurses came to check on her and I fell back asleep. Then 2 hours later, Wade's phone starts going off. My first thought is why in the world does Wade have an alarm set for the middle of the night. He then hands me the phone and Wade's mom is on the other end. I hear the words, "Sydney's entire tube has come out! "If you know anything about g-tubes the actual button came out and the balloon of saline was still full!Her tube has only been in for a week and a half and the doctors had told us unless it had been a month to not attempt to put it back in because it could push the stomach away from the abdominal wall. So Bev, Howard, Adleigh and Syd headed up to the children's ER. I made my way from our floor to meet them.In all this, Sydney was fine and happy. I opened the door and she smiled at me and said hi. Thankfully, they saw us quickly since these stomach holes can close up quickly if the tube is out. The doctor was able to place a tube back in and it went in easily. I was thanking the Lord for sparing us another surgery. We were in the ER for for about 3 hours and Sydney went back home and I headed back upstairs. Even when we feel like everything is happening at once, when we feel we may get crushed or pressed from every side, we can overcome because of the all-surpassing power of God is in us. I am not expected to be able to overcome but Jesus can. He can lift us up, give us the strength and peace to overcome and we can share it with others. I know there are a lot of things other people are going through that are far more crushing than ours, but if sharing our story can give you hope to trust in the Lord then I want to be obedient. In the last few weeks, we have spent a lot of time in the hospital and talking about different procedures. I have felt pretty overwhelmed dealing with the medical issues that we are facing. In my head I know that each of these procedures will help our kids but you heart just hurts to see your kids go through surgeries and be in pain. Pastor Steven had an amazing message this past weekend that preached on taking a difficult time and calling it what you want. So our family is calling this season we our in as catalyst for our girls to be healthier and stronger. If you haven't watched the sermon you need to watch it now! Check it out here. I will try to do a decent job of catching everyone up on things since it has been a few months since my last post. She is growing up so fast. She is saying all kinds of words, loves books and stuffed animals, and thinks her sisters are the best things ever. She has started saying my favorite kid phrase ever "hold you." 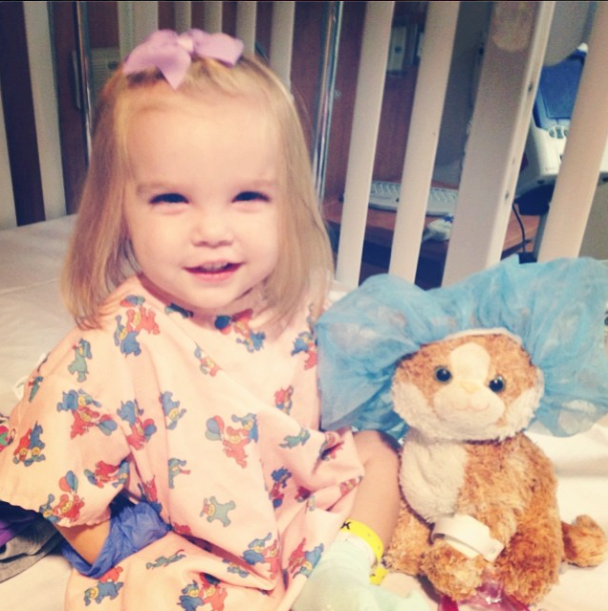 In February, we went to CF clinic and they were concerned that she hadn't gained much weight. We went back and forth several months seeing if we could get her to try fattier foods, more food, shakes...believe me we tried everything. But Sydney is one of the pickiest eaters of all time and even food that she likes she will sometimes refuse. So about a week and a half ago, Sydney had another round of constipation, refused to take the medicines that would help her, and didn't drink much water so we were back in the hospital for dehydration. 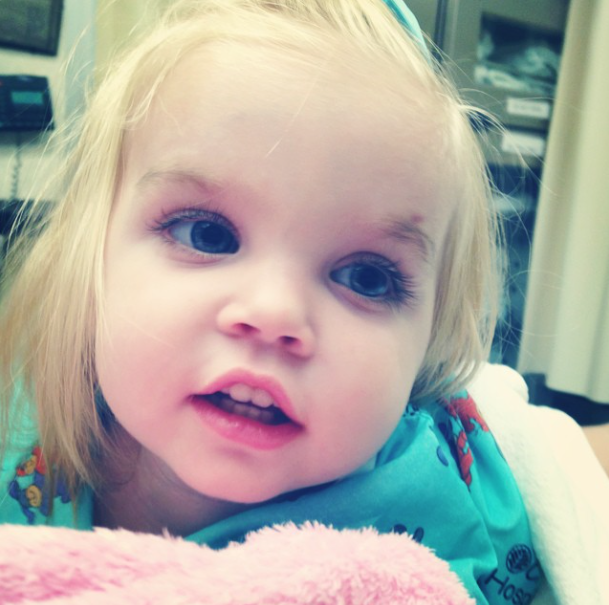 Her CF doctors decided that it was time to put in the G-tube to help get her on the right track. So Sydney has had her G-tube for over a week and is doing pretty good with it. She is starting to heal and just throws a fit when we have to connect and disconnect the tube. Thankfully her feeds are just at night right now. As I am writing this, we are in the hospital with Liana (1 week after Sydney got out) to see if she still needs her shunt. 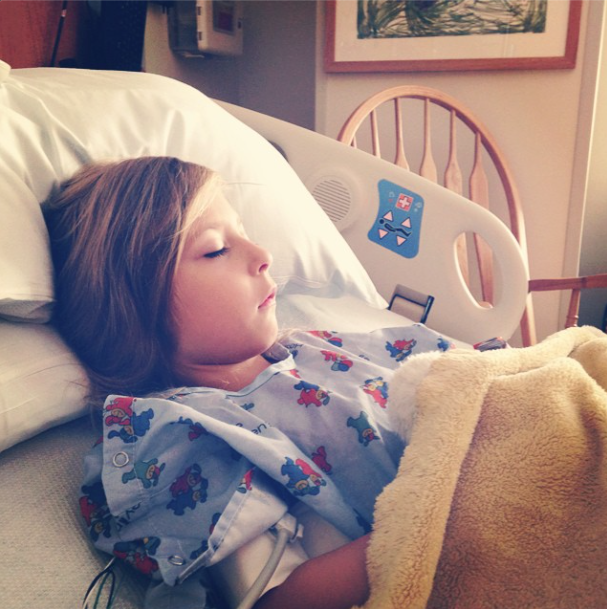 She had been having headaches and all her CT scans showed her ventricles were small. She also had fluid in her abdomen so when we added all those together her doctors figured this was the time to either do a revision or remove the shunt. And our family is praying hard it can be removed! We will be in the hospital about a week while they monitor how she does with her tube being drained and then clamped off. 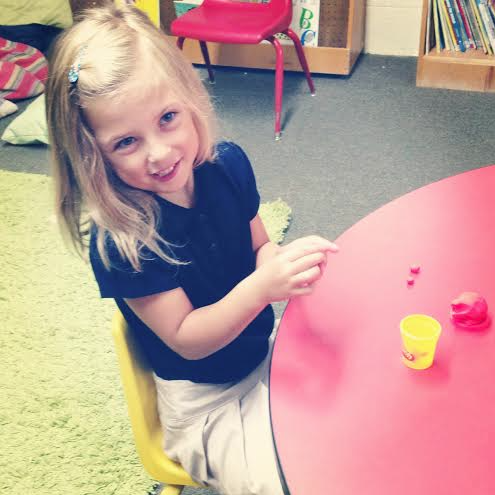 It is crazy timing since Liana will miss her first week of school. We did manage to work it out that she could go her first day of school though. She is healthy and happy. She has been such a helper in our house as we have been in hospital mode. Adleigh is going to school without Liana which she was a bit nervous about. Yesterday was our first day of school so it has been a little crazy getting ready for that as well. On a fun note, Adleigh has been talking a lot about wanting to do gymnastics and I think she will be wonderful at it. But how do you find the time to add that in?! And also, I am extremely thankful for all of you who are praying for our family. There has been a lot going on but we are believing for great things and are grateful we know our God is in control of this all! Please continue to pray for healing and no shunt. Also, pray for Wade's parents as they are taking care of Adleigh and Sydney. They are having to take over care for Sydney with the G-tube which is a little intimidating. I am beyond grateful for our church family and they have made a schedule of nurses that can come help and people are helping us in the hospital as well. I will keep you updated on how things are going! What are your words saying? I love our church and I love our Ekidz program. 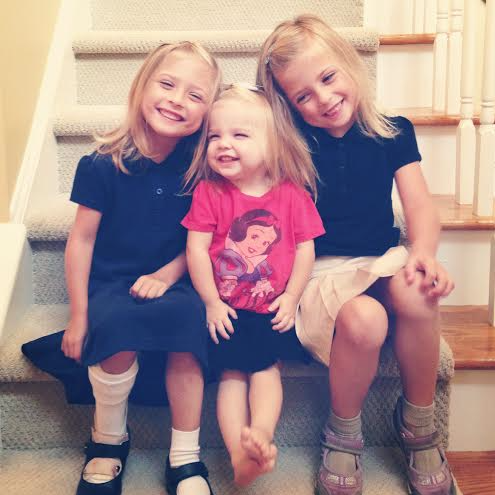 My girls come home each week excited to tell me about their Bible story and what they learned for the day. This weekend they were super excited to tell me about their Bible verse. We had the most amazing conversation about how our words can either build people up or hurt them and how Jesus loves when we are kind to others. We talked about examples of how we can say pleasing words. Their examples: "Tell my friends at school that I like playing with them." "Tell my sister we can share the toy." "Say kind words but also do kind things for people, like open a door for them." I love opening up these discussions with my 5 year olds and hearing what their little minds come up with. We have even had several moments this week where the girls started getting mad at one another and saying somewhat mean things, but all I had to say was "may these words of my mouth..." and they corrected themselves. I think I sometimes fear that kids will be mean because my children may look different or go to the doctor way more, but I have girls that truly want the words from their mouth to be pleasing to the Lord. And I think that when we act that way it opens the door for those around us to act with kindness. Of course we are all human, 5 years olds and 50 year olds will say unkind things but what do you do when you remember that Jesus is listening to all the words that you say? I love that the Bible is for everyone! This verse is just as much for me as it is for my 5 year olds. What things are coming out of my mouth? Am I building others up? Am I voicing things out of love? What have I said that could be hurtful that I need to apologize for? What things am I saying that I don't truly understand and instead need to show restraint and keep my words in? Am I showing the fruits of the spirit (love, joy, peace, patience, kindness, goodness, faithfulness, gentleness, self-control) in the way I speak? How much better could our day go if we start by saying "May these words of my mouth be pleasing to you Jesus"? If you are from the South you know that last week we had one of the largest amounts of snow that I have seen in a long time! And then the past two days my kids have been wearing short sleeve shirts. The weather here is definitely interesting. I wanted let you know some of the stuff that we did in the snow that incorporated some of our therapy but Liana had fun instead of thinking it was work. You probably won't be in the snow again this year but maybe it will be helpful for the next time. And pretty much all of these are things you would do anyway but now you can see what a great job you are doing by throwing PT and OT in there! 1. We went sledding. We don't own a legit sled but we tried various methods to go down the hill. We used cardboard, laundry baskets, and a plastic bin lid in a trash bag. Our personal favorite ended up being the bin top in a trash bag. The girls had to bunch up the trash bag at the end and Liana had to use two hands to sled and also even her weight on both sides to not fall off. 2. We rolled down our hill. Both girls got on their side and rolled down our hill. Liana loved this but it was challenging for her to keep rolling. I know that was using a lot of core strength for her. 3. Snowballs. Who doesn't love to throw snowballs? We had to use two hands to pack the snow and then we worked on aiming it at targets (mostly Wade). 4. Snowman. I think our family made a pretty impressive snowman. The girls helped make snowballs and would roll them on the ground to get them bigger. They also had to help with packing and placing the snowman accessories on. 5. Snow cream. The girls actually didn't help me make this, but this would have been a perfect opportunity to have Liana scoop up the fresh snow with a big spoon and then stir all the ingredients together. Guess we can do that next time. However, here is the ingredient for snow cream that I used. I was hoping to add some pictures but my computer needs to load them so hopefully I can update this post soon with those. I love being part of Elevation Church. The people are amazing, we serve with so many wonderful outreach partners, our worship experiences are incredible and we are truly blessed to get to hear an awesome message every week from Pastor Steven Furtick. If you didn't get to hear the first week of the Crash the Chatterbox series you have to listen to it soon. You can go to watch it here. In the sermon, Pastor Steven talks about how the "chatterbox" is the lies that surround you (from others and in your own head) and if you listen to them can keep you from the person God has designed you to be. "A good mom would never yell at her kids like I just did"
"My kids would be better off with someone else"
"I am not equipped or prepared to handle this"
The chatterbox can bring so many more thoughts into your mind that discourages you and pushes you to give up. But we have hope in Jesus. Jesus has defeated the enemy. He has power over the chatterbox and when you walk in the confidence of being a child of God you can overcome the chatterbox. One of my favorite parts of the sermon was realizing "we can't stop or control what the chatterbox says to us but we can learn to block it out." Pastor showed the example of wearing headphones that can drown out the outside noise but we can also plug it into the living word and hear the voice of our Father. This week when you want to think you aren't good enough, you can't handle it, you don't have what it takes...remember that you are fearfully and wonderfully made (Psalm 139:14). 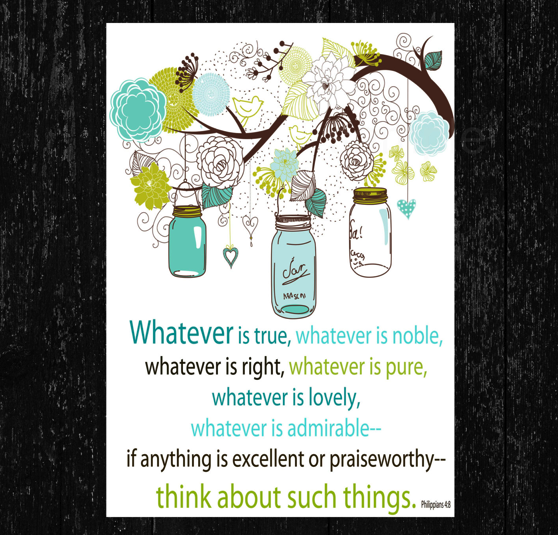 And use this verse to change your inner thoughts from negative ones to ones that are uplifting! I thought it would be fun to give you a few pictures each Friday of what our family has been up to the past week! We practiced a modified Constraint therapy and Liana did such a great job eating her spring roll with her right hand! Of course we have a few pictures of our snow day! And to finish off the week, Wade took Liana on a Daddy Date Night. Over the years, we have used many different gross and fine motor therapy toys (thanks to my husband's generous mom!). One that my girls enjoyed a lot was the red rocker. On one side it is a set of stairs that works on learning to step up and balance. The other side is a rocking boat that both girls had enough space to sit in and as they rocked back and forth (similar to a see-saw) Liana was able to work on strengthening her torso to stay steady. This toy was incredibly helpful when Liana was first learning to walk and as she learned how to conquer stepping up on a curb or even helping her learn how to walk up our own stairs. If she happened to fall on these steps it wasn't a long fall and we also bought the rails to go with it so she was able to hold on. We worked on alternating which foot was the leader and using both right and left hands to hold the rail. One of their favorite things to do when they were around 2 was to sit in on the boat side and pretend they were going on safaris. They would point to all the animals they saw as Wade or I rocked the boat like they were bumping along the road. I love having therapy tools that the children don't realize is therapy. And this red rocker did just that. If your child is in need of working on steps or balance this is a great tool to have. We have the one that is plastic but there is also a wooden version. Enjoy playing! Here are the girls about 2 years old playing in their Red Rocker. And yes Liana was eating purple sand before I took the picture. 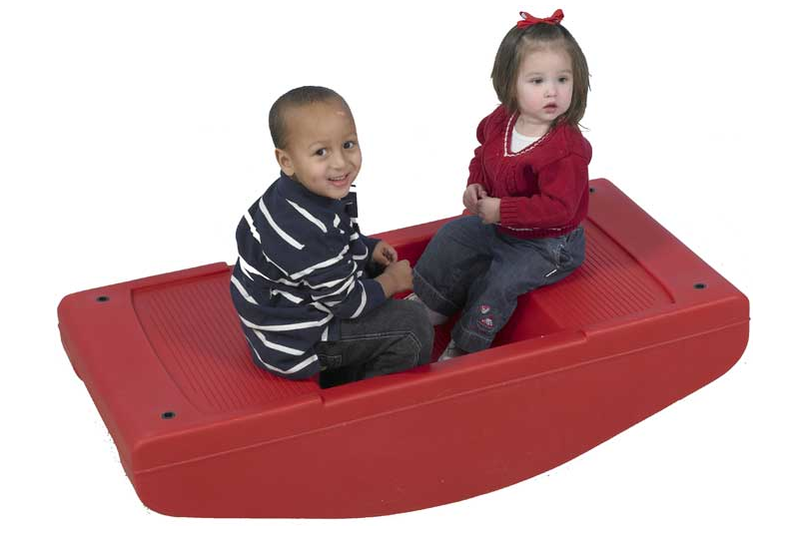 Here is a link where you can order from Children's Factory the Red Rocker.